Mollamamba or Molla was the daughter of Kesana Setti who was a potter by profession. The name indicates that they belonged to the Vysya community. 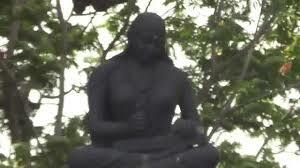 Earlier historians placed her as a contemporary of Tikkana Somayaji during the times of Kakatiya empire. But, Kandukuri Veeresalingam Pantulu in his ‘Andhra Kavula Charitra’ points out that she was a contemporary of Sri Krishna Deva Raya, disproving the earlier claims that she was the sister of Kummara Gurunatha who was the scribe of Tikkana Somayaji in translating Mahabharata. Her salutations to poets like Srinatha who lived in the periods between the Kakatiya and Vijayanagara empires point out that they predated her. Molla mentions her family tree in the beginning of the epic. The absence of her mentioning about her husband or the marital family led to speculations that she was either unmarried, or a child widow who stayed at her father’s place. Historians express their admiration over her breaking the glass ceiling of gender and caste in carving a niche of her own among the Telugu poetical sphere. But to those who are aware of the penetration of literary aptitude during the rule of Sri Krishna Deva Raya would not find it as strange. A folklore existed which spoke about the Guards of the king dismissing a poet saying every kid on the streets of the empire under the Rayas could compose poetry, Raya himself being an acclaimed scholar. Mollamamba indirectly admits that her poetry was mostly self-taught. Unlike other poets, she does not acknowledge the guru who taught her literature, but says she could compose this by the grace of Sri Kantha Malleshwara, her family deity. However, it might just be her humility that she denies knowledge of literature. But her ode to her literary predecessors contrasts her humble disclaimer. She has included Valmiki, Vyasa, Bharavi, Magha, Bhavabhuti, Bana Bhatta,Siva Bhadra (I came to know of him only through her poem), Kalidasa, Bheema Kavi, Nannayya and Srinatha. While it is understandable that a commoner would know about Valmiki and Vyasa, Molla’s mention of Bharavi, BhavaBhuti, Magha and the likes does show her acquaintance with scholarly works which were not that popular with commoners. More than a third of the vocabulary used in the above poem has Sanskrit words. This contradicts Mollamamba’s reluctance to use Sanskrit words while translating the epic into Telugu. One way the historians can reconcile to this contradiction is by dwelling into prevailing form of Telugu that was in vogue during her times. It could have been possible that even the spoken language of Telugu was deeply intertwined with Sanskrit in her surroundings. Kandukuri Veeresalingam extols her style of poetry as no less than scholarly while using vernacular vocabulary ensuring a free flow of the narration while balancing it with rhythmical melody that suited the poetry of those times. The below poem describes the princes and Kings who ruled the Kingdom of Koshala. One can observe that the word Raju (King) appears in multiple contexts. They are like the kings of night (moon) in radiance, like Kings of Love (Cupid) in appearance, like kings of sea in charity, like kings of jungle (Lion) in valour, like the kings of cattle (Bull) in appetite, King of Day (Sun) in wealth of posterity, Kings of Kings (Emperors) in reputation and like princes while in the city. This could be one derived usage of an alankara (Ornamentation in poetical sense) called Laataanuprasa which indulges in using the same word with same meaning but in different contextual sense. Her narration of Ramayana is crisp and is roughly 900 verse long. Mollamamba has excised a significant amount of liberty in her narrative and has not religiously stuck to Valmiki’s narrative. She has condensed the extensive descriptions of the flora and fauna that Valmiki has indulged in his original version and has focussed only on the plot. Other episodes overlooked in Molla’s Ramayana are the Lakshmana Rekha episode (which is absent even in Valmiki’s version as it was only a creation of Tulsidas in Rama Charita Manas), Uttara Ramayana or the story after the Pattabhisheka of Rama, dialogue between Jabali and Rama and some of the sub plots. She has taken the liberty of attributing Rama’s lament and rage after Sita’s Abduction to Lakshmana. It was her strong belief that Rama was an embodiment of poise and that he would not resort to violent swearing as depicted by Valmiki. Kandukuri Veeresalingam speaks about minor grammatical violations in Mollamamba’s poetry. Some scholars opine that she had a narrative style closer to spoken dialect which did overlook certain grammatical constraints. There are others who feel that most of the so called errors are just typographical as Mollamamba was not known to engage a professional scribe like the eminent poets of her period. But critics and admirers have admitted that her style of poetry captured the rhythmic vocabulary which makes it pleasurable as well as easier for a common reader to read, memorize and remember the poems. Academics have opined over and again that Mollamamba epitomizes women’s education, liberty and progress and parts of her work have been included in School curricula as a part of Telugu Language. As an enthusiast, I would wish every Telugu speaking person to read through her Ramayana and enjoy the melodious rhythm that would continue to linger, just like the taste of honey would linger on one’s tongue. సందోహ స్తుత్య భూమ! జానకి రామ ! Rama, the beloved of Janaki! 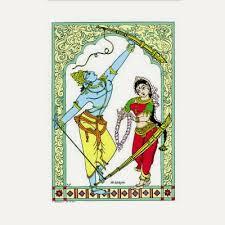 The one with the form of Kamadeva, the one who broke the bow of the ‘enemy of Kamadeva’ (Shiva)! The very source of grace! The one with the revered auspicious name! The one eulogised by the countless sages! This entry was posted in Indian Poets, Telugu, Vijayanagara Empire. Bookmark the permalink. don’t exactly remember where i heard those. I think its probably Krishna Deva Raya. I look forward for you to cover many more poets. Thanks Kranti. Shall do our best to cover the literosphere of Telugu here. An. Excellent effort and lucid style makes a hearty reading continue to enlighten us.